1,000 Books Before Kindergarten is a Nevada based non-profit working to promote early literacy across the country and has even reached parts of Canada. We are excited to announce this program's arrival here at Killingly Public Library! 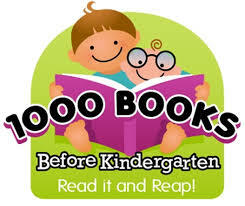 Stop in to register your child(ren) and receive your 1,000 Books Before Kindergarten Starter-Kit. Each Starter Kit includes an official 1,000 Books Binder, Instructions, and the first section of your Reading Log. Stop in with each completed log section for a prize and your next log! Prizes are given at 250, 500, 750, and 1,000 books. Yes! You can repeat books! Once you have reached 1,000 books, come in and show us all the books you've read, receive your official KPL 1,000 Books Before Kindergarten T-Shirt, and claim your spot on our 1,000 Books Wall of Fame! ​Accept the challenge! Visit us and register today! Your child must be registered for the program to be eligible for prizes. This program is sponsored by The Friends of Killingly Library. This would not be possible without their continued support. A very special thank you to them! The 1,000 Books Before Kindergarten iOS app is now available! If you prefer to use the app to log your reading on your iPhone or iPad, we will accept that format as well!